earlier on in the year I blogged about AD based signatures for 2003 and 2007 outlook (find the post here), It seems I am not the only person that needs this, I have been getting rather high stats on this topic and a few questions. So I thought I would go through a little more in detail in terms of what you have to modify and how you would go about implementing the script into an AD based environment. NOTE: DO NOT COPY AND PASTE THE BELOW SCRIPT IT WILL NOT WORK, as there are various comments to show you what you need to change. Please refer to the previous post which has the original code, which you should copy, paste and modify. ‘ Tested on Vista, XP, XP64 and office 2003 and 2007. ‘ Read LDAP(Active Directory) information to asigns the user’s info to variables. ‘ This section creates the signature files names and locations. ‘ Example is based on Dutch version. ‘ This section checks if the signature directory exits and if not creates one. ‘ This section deletes to other signatures. ‘ These signatures are automaticly created by Outlook 2003. I will highlight them red so you can see where they actully are used within the HTML, I did not use all of the variables listed above. “running this script.” – this is the message when error occurs, change it to desired. Now on to how to implement it into AD. scripts in the following location (we do this so that the scripts are replicated through our AD servers, if you have multiple AD server I recommend putting it in the same place. 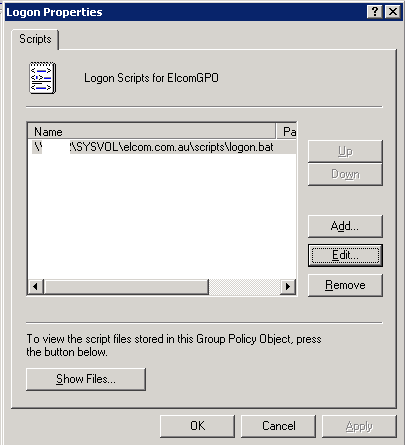 Now you to the users that you are applying this script to you must have a GROUP POLICY that is applied to those users, if not create one, or just use the default domain policy. double click on logon, you will see the below screen, you may not have anything in it just yet though, to add the location go to ‘Add’ and then simply browse to the location of the VBS. 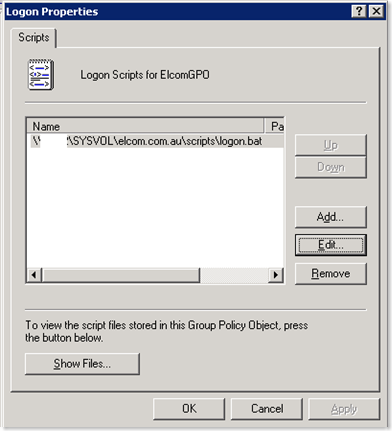 I am using a logon.bat because we have various logon scripts we execute, so we have complied it into just the one batch file that opens and executes all scripts. Once you have added the file press OK.
then log off and then on, open outlook and test. For any 2007 users if you find that after you run the script and then you or a user opens outlook after login and they revive the error message that from teh script saying that outlook is open, well there is a way around that too. Hopefully this helps a few more people. This entry was posted on Wednesday, May 14th, 2008 at 4:05 am	and is filed under Microsoft, Software, Techie	. You can follow any responses to this entry through the RSS 2.0 feed. You can leave a response, or trackback from your own site. hope u could help me. and open outlook and you should have a signature. If its not working let me know email directly. You’re the man! Thanks a lot, I’m now revising it according to the company’s info. I am now seriously considering of implementing this code into my domain. However, since I have absolutely no idea concerning scripting, I have a question. What if I just want my users to maintain their personal signatures, and add one or two lines of code into the HTML of the signature. For example, add an image and a disclaimer (i do not have exchange). Can that be done by scripting? This just came to me as it seems easier that maintaining an up-to-date AD concerning user details. I will research on this thought by my own, however hour help would be much appreciated. I know what your saying with personal signaturs, but being that all singatures are stored on the local PC, it would very hard to do this. the idead of this signature is simple to enforce a company standard. Unfortunatly I know now way that you can change different indivual signatures, that would be extreamly hard I would think. However you dont need an exchange server to implement this just Outlook and AD thats it. Hi Brad, this script looks fine, but isn’t it possibel to work with embedded images (logo) i see you used a link to your website ? Brad, the script does create a signature file and does delete the otehr signature files but it doesn’t place the new one as default ??? ‘ This section disables the change of the signature by the user. ‘ This section checks if the signature directory exist and if not creates one. ‘ This section deletes two other signatures. Hi Peter, do you mean embed by img src?? If so then yes of course you can do this but the the user may not see this, because you would be embeding an image that you see locally. Hi peter DO NOT USE this above script (it has comments that will cause you errors) I have simply hilighted the points that you need to change use the script that I first supplied on the first AD outlook post, and hen go through this post and then change the hilighted points then you cant go wrong. Fantastic! This was exactly what was needed. Same ‘basic’ editing of the script and WALLA! Moving this further along, can this method be applied for OWA? I am doing some further checking on this and haven’t found anything yet but if you know something that could assist..? Thanks so much for this, works beautifully and easily customisable for my purposes. Exactly what I have been looking for. This will give us a bit of control over our email signatures. This is a far better solution than tagging the email as it goes through the SMTP server. At least this way the users can see the signature in their email when they are typing it up. Great script! But i still have a question..
Is it possible for this script to create a “reply signature” as wel? Is there a way to make the signature the default replies/forwards signature and new messages signature. ? is it not a registry entry ? ir do i change the myArry to my signature name ? this will give you both forward/reply and new message by default. Me again. I am using your work, Great! Just a question, are there any chances of changing the font type? For example I will use Arial instead of Verdana and its size, can I change it? I tried but can’t. I am also looking for way to embed an image little icon because I will use this phrase “Please consider our environment before printing this em-mail.” at the bottom.” When I use the URL address of the image, those users that has no internet access can’t see the image. for the fonts easy – as you can see in my code I am using font attributes with a Span tag, just add your font face you want. As for the embed images, I would say go and have alook around on some HTML forums and see what you can do, I am sure its possible, after all its just HTML. thats a great question, and to be honest, I don’t if we can set the reply as a default HTML as a reply value if the original email was a text format, simply because people will send in a text format, so outlook will use that same format to reply. Thanks for your input, I’ve since researched that Microsoft make that desicion – cheers Bill. Thanks for the reply Mike. I decided to pass on the app. Instead, I just added code to create a new plain text signature and then set the mail format to be HTML via group policy. By setting all email to be HTML, this should prevent staff from sending rich text by default (I hope). Hi! First thanks for the article, great script that I will probably implement in our company. I’ve got a little issue though that I’m not sure where it’s from. Everything works fine with the script and the local policy, but if I open the Mail Format tab in the Outlook options, the next time I create a new message or reply, the signature is gone. Do you know if this would be a script or policy issue? Make sure these are created you can see new signature and also reply-forward within the registry, and the path to the location of the html file. and see if the htm files exsit. If they dont then for what ever reason they are not being craeted or being deleted by a third party appliaction? Many thanks for this very useful information! I am working with Outlook XP, the script works so far, but it doesn’t create a .rtf and .txt file.. So replying on a plain-text e-mail gives an error. Can anybody help me with that? Thanks! Regarding reply signatures. I have tried to figure out making different reply signatures and cannot figure out how to do it – Is it possible with this script to make different reply/forward signatures? Sure why not have 2 of these scripts being they are controlled by a group policy there is no limit to what you can do you could have one for each dpt if required, for you needs you need to pull out the registry stuff that relates to the new mail message and keep the reply/forward. make sure you name the .htm, rtf and txt file different to the first one, might be even better if you put it in a new folder. Seems when i reply to an email with clear text my reply signature becomes text only. Problem is when I after having replied to a text mail, my primary signature for new messages is NONE. Do you have any suggestion to why this might be so? Thanks for publishing this. It’s a great solution. FWIW to those who may be interested, the lines used to prevent users from changing the signature is specific to Outlook 2003 as written, but can be easily adjusted to work with Outlook 2007 by changing “11.0″ to “12.0″. Christian, where are you stuck?? what is happening, I would rather not do it because if I do, do it you can be sure there will be others asking the same. Lets work through this! hehe, I understand. If you look at the HTML-code for the signature design, yo will see a real mess, and her is my problem, I don’t know how to implent the VB codes in the code mess. I have tried but ends up with an error. Sorry my english, you can correct me. did you want to email it to me or post it to me so I can have a look please? Thanks, the code is to loong, sow wordpress wont let me post it. What Is your email ? This script is very nice, I love it. But I also use this script on a Terminal Server, users that logs on get the “Outlook is open error” when other users is using Outlook. Whatt?? ?+ Is there a way around this trouble? Is this working or customizable for Rich-text Signatures? sure does work with RTF, check out my later posts on this, there was one only very recently. Thank you for all the hard work on this. The amount of time you spent is truly appreciated. This has been one of the most useful posts I have ever encountered on the blogosphere and for that you are a good man. I have implemented this at my company and it works perfectly I changed up the HTML of course and my marketing team was pleased but with the beginnings of this script it is just remarkably easy to edit and make it your own. thanks for the praise very much appreciated. Love the script, I am a VB idiot and even I got it working. I have one request if I may ask. Can you show me how to change the reply signature to None in the script? easy just read on there are quite a few parts to this post due to popular demand. Excellent Script, We’ve been using a word vbs system here, and I hated it, it would log on and lock up word, and play all sorts of nasty tricks. However, We were using that because I couldn’t figure a way to have multiple signatures from a htm system. I’ve got your script to run as a logon element, and in a loop, such that all the htm’s are generated, with different names, in the same folder, but I can’t figure how to register the htms as signatures. I need it for my Directors who need to be able to sign off emails as various divisions. I see in the script that it reserves space for a variable “State”, but there is no variable setting within the script that populates the variable for use. What is the “objuser.” setting that I need to use? There are various variables that have been declared that are not used, I have done this to help any one that needs to use these. Firstly I think this is a great script! And it is just what I need to manage my end users signatures. check your registry and ensure its created the entry. Ensure in this location you can see you Signature name? if not then its not creating it in the registry therefore Outlook cant see the file, that should get you off to a good start. I’ve managed to configure it. Basically I have no idea why but I started with the script you originally posted and just replaced Elcom with my company name and then modified the HTML and now it works! Brad, I think I have modified your script correctly to display the info for my company but I was wondering if you could take a look at it before I implement it. Let me know the easiest way to upload the script to you. Thank you so much for sharing this. It looks like something that I am looking to implement. I was wondering, how would this work utilizing Thunderbird as a mail client? Hi Craig, this is specifically written for outlook mail clients, so its not going to work on the thunderbird client, sorry. 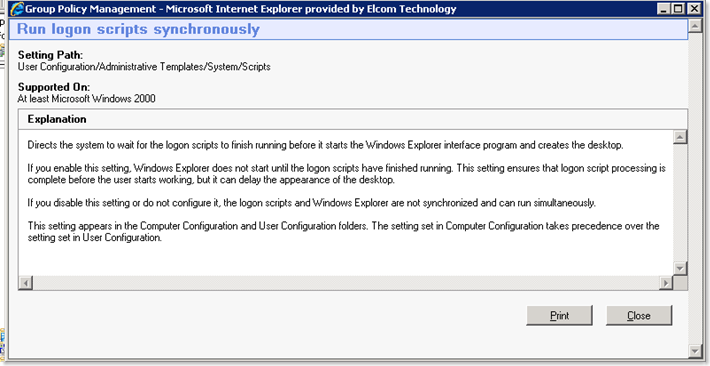 Hi Brad, what I was thinking was by changing the paths from …\Microsoft\Office\…. to the related paths for Thunderbird could this possibly be adapted? Or, is there something else that I’m missing? Is it working on terminal server 2003 and 2008? But i get a error message when i log on. “Please shut down outlook before running this script” Is there a solution?? Johan, I am assuming your loading outlook on login also… If this is the case then this is why your getting the error, you would have to run the script first and ensure it has run before outlook opens. 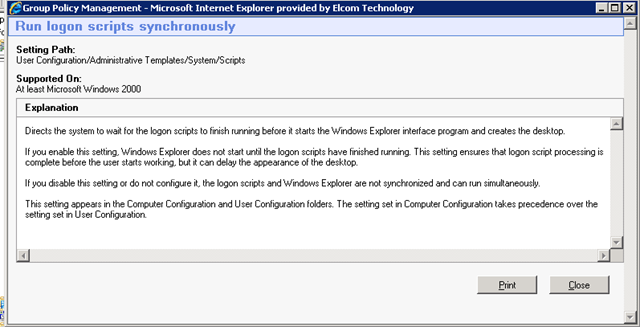 The scrip is looking for the process outlook.exe and it’s a terminal server so th process always running there. But i changed the outlook.exe to xxxxx.exe and the problem was solved. Everythign is working fine now, but will there be other problems if a do this? And thanks for a mighty script! Any solution to the terminal server issue? Sorry nothing that I know of, apart from some group policies on your server, or adding a script within the startup. Does anyone know how to get this to work on Windows 7? The script doesn’t even appear to be running, as it’s not complaining that Outlook is already open. The company that I work for runs a mix of XP Vista but PRIMARLY window 7 and it works perfectly… if it is complaining it open I would suggest you open up task a manager and make sure outlook.exe is not within your task manager still before running the script! When i logon i get there was a problem in line X and character X…. I have googled a bit but i cant find any1 with this problem, or what that is making the problem… I havent done much programing to any help would be nice. I need some more info… Whats the charter and line number it is talking about? What OS and outlook client are you using? and the same about outlook, 2003 and newer. Do you know why this error message comes? It was just the space between? My new problem now is that the outlook dont choose the signature .htm file as default? it removes all other signatures. I solved all the problems. This is a script is genius! This script is great. I’m working on implementing it, but need to make a minor tweak. How would I have it generate multiple signature files? I was looking for a section to copy/paste and modify it to use as my secondary signature, but it seems there are several references across the script. Hi, i’ve just started testing this script for my network and it works great! However, I’m a little rusty with HTML and haven’t really used VBS before at all! Im just editing the HTML part now and trying to add a table. Everytime i add a table and try to run the script i’m getting a “Error: Expected end of statement” error from “Source: Microsoft VBScript compilation error” and its always from the line i’ve just edited. But ive also tried it with objfile.write at the start of every line, with & vbCrLf at the end of every line AND trying put put the whole code, with my content in one long line. Can you see anything I’m doing wrong? I need to set a background to one area of text but can’t figure out how, and i need to add an image on have it aligned to the right of the text but cant find any options for it. Can anyone confirm if these are possible? and if possible provide some code for me to have a play with? Anything is possible… Set your style above and set it to a background image that ought to work, you can also set it in a div and float it right. I’ve got my signature(s) sorted now, however, has anyone in the comments above had any luck getting 2 signatures to run together? Preferably without setting anything as the default. I need to put a line in to seperate some text (an actual line, not a line break) and am having issues! I’ve tried using an hr tag inside a table which worked, except it always made it the whole length of the screen instead of the length i wanted and i’ve tried making the top border of my table black but that didnt work at all!